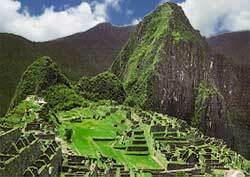 Most seasoned travelers agree that Machu Picchu in Peru is the world's most dramatic ruins. It sits boldly perched on a steep sided mountain saddle far above the partially encircling Urubamba River gorge. What remains of the precision stonework of the pre-Colombian Inca temples and palaces clearly reveals how exalted Machu Picchu was in its glory days. This is the best period. May is the prettiest month (the dense, subtropical mountain forests are exceptionally green) while August is the best all around month. The is the rainy season and therefore the least desirable period. Just before the Spanish conquest, Machu Picchu was mysteriously abandoned - and this was when it was still in its golden age. The conquering Spanish were unaware of Machu Picchu. Its existence was known only by local insiders. Machu Picchu lay buried under dense mountainous vegetation until 1911 when Yale University explorer Hiram Bingham discovered it and began the reclamation process. Click Peru for country's tourism website.